Alumnae featured at the Dance Studio of the Schwartz Center for Performing Arts. 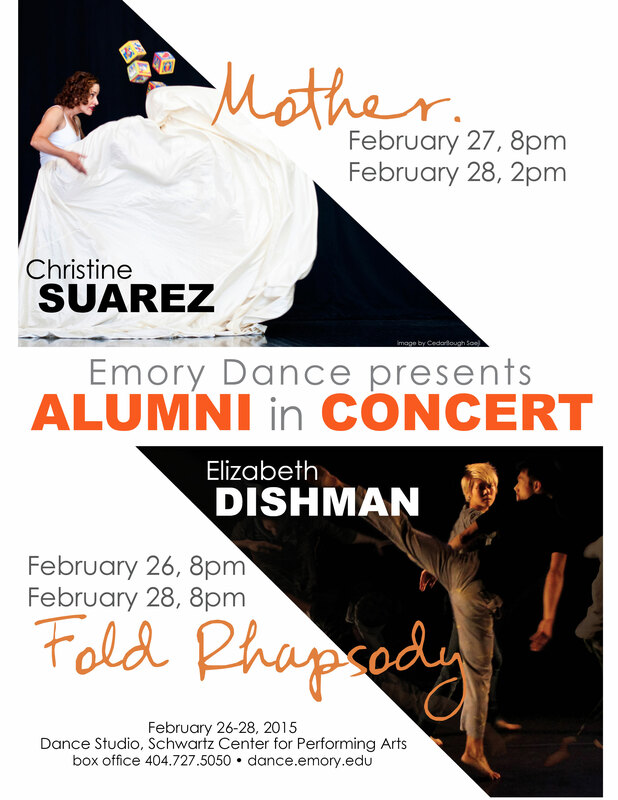 Emory Dance alumnae Elizabeth Dishman 95C and Christine Suarez 94C return to Emory’s Schwartz Center February 26-28 to present two original evening-length works. Dishman presents “Fold Rhapsody” Thursday and Saturday at 8 p.m. “Fold Rhapsody” is a series of short meditations that weave futility with delight. Some antic or absurd, others lush and deeply moving, these prop works explore boundary, freedom, isolation, and intimacy. Originally from Colorado, Dishman studied voice performance and dance at Emory University and earned her master's of fine arts degree in Choreography from The Ohio State University. Her work has been presented at venues across the United States, and Dishman was one of six choreographers selected nationwide to participate in the Susan Marshall and Company’s 2009 inaugural summer workshop. In 2001 in Atlanta, Dishman founded the now Brooklyn-based Dishman + Co. Choreography, a non-profit dance organization dedicated to the creation and presentation of stirring and keenly crafted performance works. 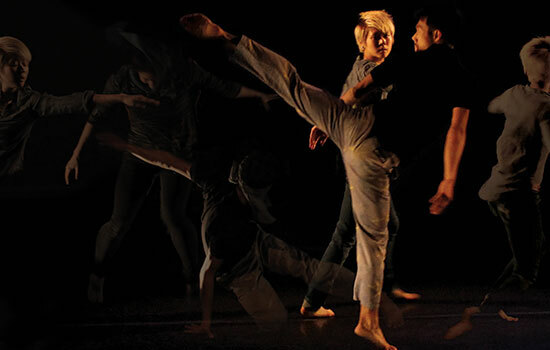 Tweet this: "Playfully provocative and joyfully impolite: Emory Dance presents Dishman and Suarez 2/26-2/28." Suarez’s “MOTHER.” plunges feet first with a joyfully impolite voice into the conflict among her shifting, struggling identities. Suarez finds poetry and heartbreak while mining the absurdity of our collective and sometimes idealized images of motherhood. Suarez performs “MOTHER.” Friday at 8 p.m. and Saturday at 2 p.m.
Born in Caracas, Venezuela, and raised in Baton Rouge, Louisiana, Suarez studied theater and English literature at Emory University and earned her master's of fine arts in Choreography from UCLA’s World Arts and Cultures Department. She has created twelve evening-length dance-theater works, numerous site-specific and community events, and more than a dozen dances for theater and film. In 1998, Suarez founded Suarez Dance Theater, an ensemble of dancers, actors, and musicians. "Fold Rhapsody" will be presented Thursday, February 26 and Saturday, February 28 at 8 p.m. "MOTHER." will show Friday, February 27 at 8 p.m. and Saturday, February 28 at 2 p.m. Tickets are $15 general admission, $12 for qualifying discount category members, and $8 for students. A discount is available if purchasing tickets for both programs. Tickets are available from the Arts at Emory Box Office (Schwartz Center, 1700 North Decatur Road, Atlanta, 30322) in person, by phone at 404.727.5050, or online at tickets.arts.emory.edu. Editor's Note: Emory Dance and Movement Studies explore the intersections of mind and body that are reflected in history and in the poetic sensibilities of the body. If you would like to support Emory's dance initiatives by becoming a Friend of Dance, please visit here. Preserving our culinary past for future generations is the goal for Morano and Elamine as they travel the world. Hour by hour, follow along while CEOs, authors, consultants, and other professionals go through their workday. Hear the president articulate how excellence, integrity, and optimism undergird all that we do. "Fashion is Individual - Forget the Must-Haves"
Every woman's style is unique, says Diane Pollack 90C. First impressions make an impact in real estate. Read these tips to put your best foot forward, buying or selling. "One of the many things I think about when I capture photos...what story is going on, what is happening to one individual at this very moment, in their own little world." Playful textiles evoke memories of Lagos, Nigeria.